Cheese and taco breadsticks! What a fantastic combination that will make everyone loves to taste. This easy dinner idea – Cheesy Taco Breadsticks are perfect snacks for Saturday night while watching your favorite TV shows with family and friends. Plus, this recipe is really simple and quite easy to make. You don’t even need much time to complete the recipe. Just take a look at the following instructions. Despite the delicious taste of the Cheesy Taco Breadsticks, the materials and ingredients needed are surprisingly easy to get. You can even find them easily at home. Here are all you need. So, have you found all the materials and ingredients needed? They are easy to get, aren’t they? 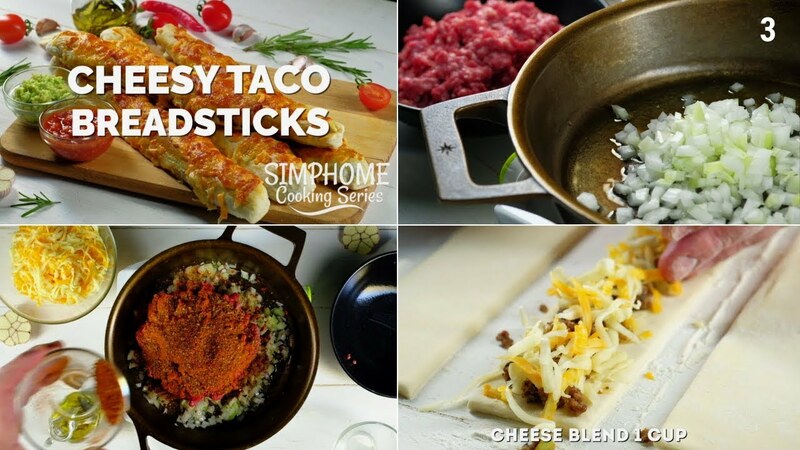 Well, now, let’s move to the steps on how to make the cheesy taco breadsticks. Prepare yourself for this fun cooking and enjoy it! For the very first step, just prepare a pan in medium size and put oil in it. Heat the oil. After that, just put 1 clove of chopped onion and garlic. Saute the ingredients well till you can smell the aroma. Next, it is time to put the ground beef on the heated pan. Saute it along with chopped garlic and onion. Stir the mixture well until they are blended thoroughly. Don’t forget to add 2 tablespoons of taco seasoning. Stir the mixture well once again. Put a pinch of salt to add the taste, stir the mixture over and over, and cook until it is ready. While waiting for the seasoned ground beef to be ready, you can start to prepare 1 lb of pizza dough. Line the pizza dough and cut it into four parts as the preparation to make the breadsticks. Set them aside for a while. When the seasoned ground beef is ready, put it into a bowl. After that, you can start to take the ground beef and put it on the cut pizza dough little by little. Put the meat stretch along the length of the cut pizza dough. Don’t forget to add cheese blend on the top of the ground meat. Once you finish with the 9th step, you need to hold both sides of each cut pizza dough so they can meet in the middle. Unite the two sides and stick them together by using your fingers till the breadsticks are formed. Use a brush to apply oil on the surface of the four breadsticks to get perfect golden brown colors when they are baked. Bake the breadsticks for about 10 minutes at 425 Fahrenheit degree or 220 Celcius degree. Once the breadsticks are completely baked, put another cheese blend on top of them. Bake the breadsticks for another 5 minutes at 4250F or 2200C. Take them out and your Cheesy Pizza Breadsticks are ready to serve. and BBQ Chicken Pizza Dippers.